Forside » Kanaliseringer » Goddess of Creation » Be Yourself! I greet you, beloved family. I reach out to embrace each and every one of you that are here in this now moment and in this alignment with me. I wish to speak in this moment about love. Love is something that everybody wants to have and their life. Be it love of a partner, love of family, love of a job, love of the angels or love of self. Love is something that can be very defining in your life. So too a sense of a lack of love will also be very defining within your life. So, while you are here together with me on the earth plane in your physical body, and in this now moment, I wish for you to feel the embrace of love that comes from me; that comes from your own divinity; that washes through blending with you. I am here. I am available as someone who can help you to have a new vision for your life. That can help you to see alternatives if there are changes you wish to make in your life. I am also here to reflect all that is working for you in your life. Remember as you think about things, as you meditate, as you pray; begin that list with what you are grateful for. Then as you move through what you are grateful for you will begin to see less and less of the things that are frustrating for you, or you will have more compassion for yourself. Whenever that is there is a lot of pressure that comes from society or other people. One of the ways that an individual feels that pressure is through judgment. You might judge that you are not in the place that you want to be, and therefore you are lacking and are not good enough. You may judge that that person over there has x y z and you want x y z, and you really want that in your life, and therefore you are not good enough because you do not have it. There is this overriding energy of judgment that has been in this vibration with which we worked for the last several months. And even though we might go and shift and create a change there’s been this underlying vibration that gets transformed and then comes back. This is why I wish to speak about this at the very beginning before anything happens; so that you may know within yourself; that you may feel my presence as I am there with you clearing out the space within and around you and clearing out the space of the collective consciousness. ~whew~ that was big. I felt a wave, and then a wave, and then a third Wave with that clearing. Most likely this is what you’ve been feeling in your everyday life that causes you to feel that struggle. If you need to clear the energy around you multiple times during the day, or just once or twice, I invite you to remember to clear the energy because chances are it is not your problem. You are just picking up something from someone else. The more that you are in the alignment with your Divinity, and that vibration as that Divinity flows through you, it empowers you and you become a light that shines through in everything that is happening. Sometimes that light may become a magnet. Sometimes that light becomes something in which things just dissolve. I wish for you to know that it is essential to clear out your energy, to clear the energy of the room, to clear the energy of your work from time to time so that you don’t get pulled into things that really do not resonate with you. So, take in a deep breath once more and feel as if you are pulling your energy together inside of you and then as you breathe out, ~whew~, just send that energy out from you. If it helps to have a visual then feel as if you are sending concentric circles of energy that move out from within your core and go out, and go out and out. There we go immediately I could feel the difference in you so I thank you for working with me at the beginning here so that we may once more clear out that energy that is constantly trying to second guess your life. So that you may be love and you may have love in whatever form most resonates with you. Take a deep breath in breathing all the way down through you. Allow your energy and focus to anchor within the Earth. It’s as if you spread out. As if those roots go out from you in many different directions anchoring you. You then let that come back up through you and you send that breath of light; you send that breath of energy; it goes up through the top of your head until you come into the space of your Higher Self. For so many of you, this feels automatic. This feels as if you are just there all the time. This is your opportunity to make a very conscious expansion that goes from you the human to your Higher Self. As you feel that expansion allow your energies to move out further. You may feel as if you find that thread of energy and light that goes all the way up to your Divinity. 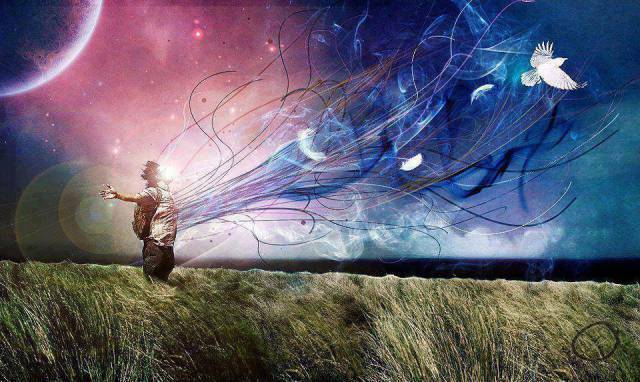 So from your Higher Self, your consciousness just naturally flows into that space. As you arrive in the space of your Divine Essence take this moment and consider what is here in front of you. For some, you may see it as you are looking at a human. For others, it may just be a vibration of energy and light. Allow your consciousness to just open up as if you are unfolding in whatever way your consciousness resides within you. You just open it up so that you may take in more and more of your Divinity. As you merge the consciousness of you the person that you are with your Divine Essence you are merging with your God service. You are merging with that part of you that lives into infinity. You are merging with that part of you that loves you unconditionally. You are merging with that part that is a constant flow into you the Human. It is a constant flow that comes through your Higher Self into you the Human. Allow your energies to expand as you merge with your own Divinity. I the Goddess move in and amongst each one of you. I reach out to embrace you in this now moment. I reach out so that my energies merge with yours amplifying all of who you are. As we do so we move into a space of the All That Is. Look around. Feel the potential. Feel the love. Feel the vibration of what is here in this now moment. As each one of you arrives within this space I invite you to take a moment and look at what is here around you. I speak about the ways in which you clear things out from this level and yet they come back into your life in the physical reality. As you look around you right now you may see some of those aspects of yourself that you have cleared that are not fully transitioned. As you allow your consciousness to take in that information ask to know first of all what part of you that you have cleared, resolved, transitioned, healed that continues to come up around you. What I invite you to notice is that in some cases it may be just a silhouette or a very faint leftover energy. For others, it may be completely gone however you still feel a niggling something. For others, it may be as if it’s all still here with you. As you are creating change within your life one of the things that humanity forgets is to be gentle, loving and nurturing with yourself. You are taught when you are young and growing up, as your family is trying to teach you how to survive in society, or how to excel, or whatever it may be. You are taught certain things that as you become the person that you are that are really not the best way for you to function. Now is your opportunity to learn to be gentle and loving with yourself. Take this moment, and as you feel the essence and the love of your Divinity that you just merged with, let that be a part of what is flowing through you like wave, upon wave, upon wave. In some, I literally felt waves of energy wash through your vibration and others it was as if they were walking in a stream. In this now moment I wish for you to clear out any preconceived notions and any past way of doing things so that you can feel the complete and unconditional love that is for you that is from your Divinity. Let yourself feel that now. As this is moving through you; oh, I can really feel a lot of emotion coming up. As this is moving through you let go of the old belief systems that say put everybody else first and you last. Let go of those old belief systems that say don’t think too much about yourself. Let go of those old belief systems that have trained you to think that you’re not good enough and that you’re not this amazing person who has lived the life that you have lived. Let go all of it and as you do so; once again I feel all that emotion going through people. Let those waves and emotion clear you out. Let it clear out your thoughts, your beliefs, let it clear out your emotions. Be in the moment. Be in the energy of love. Be yourself. ~whew~ as I said for you to be yourself suddenly it was as if the energy expanded even further. Just as you might be loving and nurturing to your child telling them how amazing they are, how beautiful they are and how they can do anything in their life say those words to yourself because you are beautiful. You are amazing. You are doing phenomenal things in your life. Indeed, release that judgment ~whew~ When I said that you are doing phenomenal things in your life I could hear people say, “yeah maybe so but not as good as them; yes, maybe so, but it’s not making any difference in the world”. It doesn’t matter. You living your life, following your dreams, aligning with your Divinity are doing amazing things and it’s a vibration that fully supports you in all that you do. Let us speak of judgment. Why do you suppose that society has so much judgment? Judgment comes from the ego and the ego comes from duality. And if one is living in duality then you must be better than someone else, you must be stronger, you must be smarter, or you’re not good enough. Over and over and over and over there are these unconscious voices or beliefs, or realities that are put forward by society that so many people tap into be it consciously or unconsciously they’re tapping into it. Are you one of them? I invite you to then pull up judgment from wherever it may be in any part of your body ~whew~ Let go of judgment. I felt a lot of that old programming just flow away from people as you cleared out judgment. Be yourself. Be who you are as your authentic self in this lifetime. Let us take a moment and as we have cleared that judgment, and as I was bringing in that energy for being authentic, I can still feel resistance to being yourself, so I would, therefore, say let us go into your consciousness. Let us follow that thread or that alignment of judgment until we can find wherever that may be in your body. Be it conscious or unconscious; be it physical, mental, emotional, let us find whatever that root source of judgment is within your life. Okay, Okay. As I speak of this let me be very clear for people that discernment is not judgment. Judgment is critical, harsh and painful whether you are judging others or judging yourself. Discernment is understanding a situation and making choices from that understanding that you have. Discernment is understanding that when it’s pouring down with rain; you go out with a raincoat. Discernment means you are using all of the tools that you have in this life and you make choices based on that on your discernment. (This is) completely different from judgment. There we go. So, let us follow judgment until you go all the way down into the cells within your body. As you consider that cellular structure of who you are, go into that moment. Go into any cells within you that are holding on to judgment of yourself or anybody else and just transform those cells. You breathe in your Divinity. You breathe in your light and it just moves into those cells within you. As I am observing you I found some people had pain in their side that was released as you cleared the cellular energy of judgment. I noticed someone else was having pressure and headaches that was released as they let go of judgment. So while judgment is coming through your mental body and your ego, it can be felt in your emotions and your physical body and in your perception of everything. There you go infuse love into every cell that has contained judgment. Infuse the vibration for who you are into every cell within your body. You have a physical reality as the expression of who you are in this lifetime. This physical reality is the blending of all those aspects of your divinity, your experiences, and your emotions. As you integrate the balance and the intrinsic energy of your Divinity it fills up every single cell and those that we have already transformed the judgment are finding its natural alignment and vibration as you integrate more and more the vibration of yourself. I ask you to once again look around you in the All That Is. I now notice that some of those remnants of what you cleared out this year are completely gone. I noticed that each one of you are more fully integrated and balanced within yourself. I noticed that the natural alignment between you the person and you in the All That Is has a much more open flow and a much more intrinsic balance. Be in this moment. Be who you are. Be yourself. Finally, when I said it that time I felt each one of you accepting and allowing that flow from your own Divinity to be the foundation and the expression of you in this life. The more that you were open to this flow, the more that you accept that you are more than just this Human. The more that you receive the vibration from your Divinity it is life changing. As the Earth continues to transform there continues to be releases of old stuck energy. I remind you to be in this moment of balance. I remind you that from a cellular structure out to every physical, emotional, mental structure of who you are that you are changing. That you have already changed and that you are already integrating the crystalline vibration that has so affected everyone’s life, physical body, and reality. You’ve done this. It’s here. It’s part of you. And as that crystalline vibration manifests within you, you will less likely have to make that conscious choice to clear out other people’s energies and other people’s lower vibration. You will have to less consciously clear out your own vibration, because they will naturally transition on their own, plus you will not receive them back into you. Once you have shifted and allowed your vibration to transform into a higher, lighter vibration, even though you get pulled down periodically, you do not stay. You notice it more and more readily and therefore immediately bring your focus back up and into the balance of this now moment. Be yourself. Listen to your dreams. Listen to your Divinity as it flows within and through you in all ways. With that, I invite you to come back together as a group. As you create this circle it is always here for everyone who is present and who might join us in the future. It’s always filled with the Light Beings. Because as the Earth completes the cycle of transformation that flow of vibration from the universal light into the Earth will be able to move so much more freely so at you will be able to have a greater sense of the nonphysical energy that is within and around you. So begin with your own vibration. Begin with you. Coming up within this room you have that sense of the Hologram of the Earth. As this Hologram comes up it’s moving through, finding the intrinsic balance that is an alignment with these energies, and as each one of you consciously sends your own vibration, your own rhythm and your own awareness into the Hologram it begins to vibrate and take on that essence of that crystalline vibration. That clearing out of judgment, which is then replaced with the crystalline vibration, and that strong powerful alignment so each person upon the Earth will know who they are as their Divinity and that will flow up and down into their physical reality. As the Holograms integrates there’s that piece that goes out into the Universe and the remainder of it goes down into the Earth plane. As it moves through it clears out the Collective Consciousness and the remainder goes down into the center of the Earth. As this is anchored within the Earth it finds its own intrinsic balance, especially associated with that crystalline energy. And then from there expands outwards throughout all the layers of the Earth. As it comes up to the surface of the Earth it is clearing out each one of you. It’s clearing out so that it may anchor within your own sense of self and it’s clearing out all the others, be they conscious or unconscious of this transformation. It is transitioning through the water, the grass, the flowers, the trees. It is transitioning through the Elementals. It is transitioning so that everything upon the Earth, not only has cleared out judgment, but is integrated with love. Love of their own divinity. Love of their own self and the balance that comes with that. As you anchor within yourself you feel your own alignment with Gaia coming up within and as you bring your consciousness back it is coming back through your I AM presence, it’s coming back down through you as your Higher Self. It’s coming back down into you and your physical reality, and as you are grounding these energies take a moment feeling your Divinity as it moves through you. Feel how your cells have transitioned through this journey this evening; feel, sense and know what it is to be yourself and what it is to be the authentic person that is the reflection of your Divinity. Let all of that move through you, clearing out, shifting and balancing. As you are living your life upon the Earth be yourself whatever that may be in any given moment. Be true to who you are. Allow yourself to in your everyday physical reality to completely clear out judgment just as we did in this journey. Allow discernment and choice to be the foundation of how you are expressing in this life. With the root of everything, that cellular transformation into loving energies be it that the foundation is always love. So be yourself and be loved.